Usually we create executable in the front-end, but this can be done from the database tier i.e. back-end too. Below is the PL/SQL code to create an executable from back-end. 1] The above API inserts the new records in FND_EXECUTABLES and FND_EXECUTABLES_TL table. Usually we create Concurrent program in the front-end, but this can be done from the database tier too. Below is the program to create a Concurrent program from back-end. 1] The various output types are ‘PS’, ‘PDF’, ‘HTML’, ‘TEXT’, ‘PCL’, ‘XML’. Usually we Attach Concurrent program to the request group in the front-end, but this can be done from database tier too. 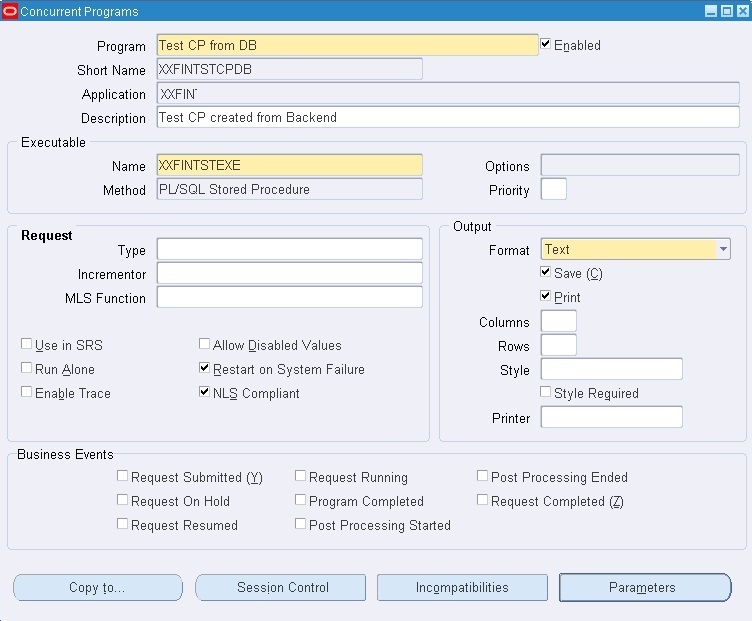 Below is the program to Attach Concurrent program to the request group from back-end. Apart from these APIs, the above package also contains to create/delete parameters, delete executable, and delete concurrent programs and all.